Oppo R19 is an upcoming smartphone from the Chinese smartphone manufacturer Oppo. The device has already made its presence in various leaks and renders revealing some of the key details about its design and specs. The upcoming Oppo R19 render recently appeared on Twitter which revealed, that the device would feature an in-display fingerprint sensor and a waterdrop Notch, like seen on the Oppo R17. 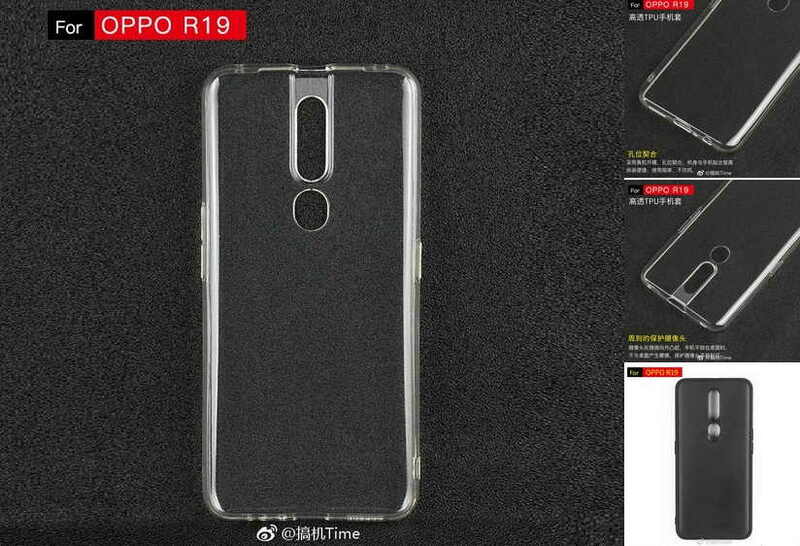 Now we have some new images of the upcoming Oppo R19 protective case. A reliable Twitter source @bang_gogo_ shared the new images of the Oppo R19 protective cases. The image shows a transparent and a non-transparent case for the Oppo R19. As we can see clearly, the case features a big cutout for the dual rear camera placements. Underneath the cameras, we also see a small hole for the fingerprint sensor. Now this means, that the upcoming Oppo R19 may not come with an in-display fingerprint sensor as it was being expected and speculated before. However, Oppo is yet to confirm the device specs, as it hasn’t made any announcements as yet.